APGI researchers are constantly striving to improve the overall outcome for pancreatic cancer patients. Financial support is essential for our research to continue. All donations are greatly appreciated and there are a number of different ways you can help us to reach our goals. All donations made using the directions below directly support APGI pancreatic cancer research at the Garvan Institute of Medical Research. Donations are processed via the Garvan Research Foundation and those AUD$2 and above are tax-deductible. Visit the Garvan Supporter Centre and fill in the online form. In Memoriam donations can also be made online. 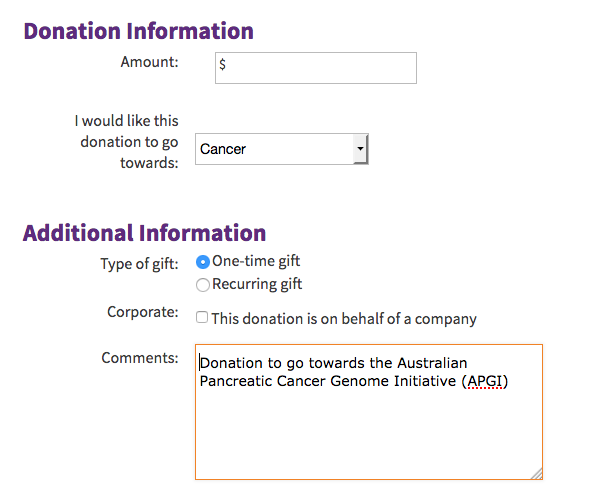 For donations to support The APGI’s Pancreatic Cancer Research, In the “Donation Information” section, please select “Cancer” in the drop down menu and specify “Donations to go towards the Australian Pancreatic Cancer Genome Initiative (APGI)” in the comments section as per the image to the right. To donate by phone, please call the Garvan Foundation Supporter Line on 1300 73 66 77 (9am to 5pm). Please note that the Garvan Institute collects personal information to process donations. Please be sure to read the Garvan Supporter Centre Policy to further understand what information is collected and what it is used for.